This bas relief shows an enthroned bodhisattva framed by two columns with Corinthian inspired capitals. It depicts the episode where Maitreya is enthroned in the Tushita Heaven, paradise of the thirty-three gods, before coming down to earth as the future Buddha. The resemblance to an Indian prince, the fabrics, necklaces and earrings all indicate a bodhisattva figure in conformity with hinâyâna Bouddhist iconography. The chignon hairstyle is typical of Maitreya, and the crossed leg position is frequently encountered in Gandharian iconography. He is flanked by two minute, richly attired assistants who are listening to him attentively while women on balconies turn towards the bodhisattva and appear to be paying him homage. The presence of two guards, one at either end of the bas relief, strikes a harsher, solemn, military note. These are yavana, foreign mercenaries recruited as palace guards. Although typical of Gandhâra art with its horizontal frieze layout, framing columns with Corinthian capitals, and restricted number of protagonists, this sculpture nevertheless possesses the hieratic quality and monumentality of Parthian art and Iranian styles.Like all sculptures of the period, these objects were coloured. They were plaques which were embedded into the walls of buildings by means of tenon and mortise joints.Such bas reliefs covered the walls of Buddhist edifices and were intended to illustrate episodes from the life of Buddha for the benefit of the faithful. 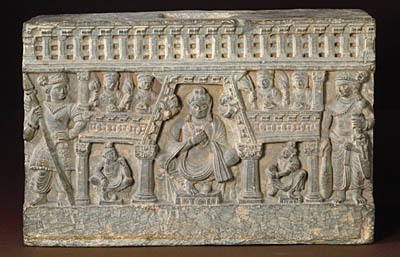 Under the late Kushans, a dynasty that ruled Northern India, Pakistan and Afghanistan, Buddhism experience a major expansion that led to the building of numerous monasteries. The strategic location of Kushan Buddhism on the Silk Road was an important factor behind the spread of its iconography as far as China via Kucha.